I took the day of Monday to get some stuff done around the house. I installed a ceiling fan in our bedroom, put up Kobe and Alessi's growth charts, installed a hoist to store my bike sus pended from the top of the garage, changed this lightbulb at the to p of our stairs and bought a push reel mower to replace our Honda lawnmower after it wouldn't start. OK that doesn't sound like a lot of stuff, now that i write it down...but it was...really. My dad was just telling me a couple of weeks ago how his honda mower had failed and the repair shop couldn't tell him what was wrong and they were going to charge him for looking at it. My Honda mower is 10 years old. After paying 10 bucks for 3 gallons of gas for the mower and my gas-powered weed wacker, then not being able to start the mower, the gas is fuming up the garage, I was fed up and decided to go old school. I'll tell you that this thing works like a charm too. 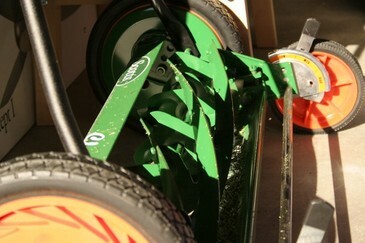 In a lot of ways, it seems like more R&D has gone into this push reel mower than my gas-powered one. The push reel has 5 blades and a sort of fly wheel, so it seems much more efficient. If you think about it, I'm having to walk the lawn anyway with the gas-powered one and it does take effort to fight against the self-propulsion and push to tilt and turn the mower. The push reel mower is smaller so it takes up less room in the garage, i can carry it through the back yard to the front 'yard' and it's appropriate for the amount of yard that we have. Using a gas mower for our strip of grass in the front and small back yard is overkill. Google has come out with a notbook concept. Companies have had similar concepts for years. How do you assist users in tasks like doing research, aggregating pieces of information and make it easy to access and organize. Microsoft's Tablet PC has a lot of scenarios around this, tabbed browsing in Firefox attempts this, there are dozens of web clipping apps out there. It's kind of the nature of blogging as well. Find interesting stuff you want to keep around, blog it, categorize it for easy retrieval later. I had a blog that I've created specifically for keeping research: links, pictures, comments, etc. for stuff that I didn't really want to blog about, but blogging was a sort of convenient mechanism. Google's notebook is interesting because it allows you to categorize and move items within lists by drag and drop. However, I think you desperately need to be able to apply multiple categories to notebook items and group by dates as well. Also, what would be nice is to be able to prioritize within a category. For instance, if I'm shopping for a lens to buy. I may make notes on several lenses, storing links to reviews, sample pictures, and multiple vendors to buy them from. As I narrow in on my decision, I want to promote the short list, maybe do some more indepth research. I don't want to lose the past stuff, and want it still associated with the overall notebook of lens research, but I want to focus on maybe 2 lenses, and save the rest of the research for a next purchase down the road. For those of you frustrated with your organizer and want a, er, more temporary solution, here's PocketMod. It's pretty silly, but cool.